Want to give your home a little Ghost town flair? This spooky season should be fun! You can go as far as you want. Play old-timey piano music. Create your own Jail for awesome mug shots. You can do all sorts of DIY crafts to create wagon wheels, swinging saloon doors, and bundles of cartoon style dynamite. While you can give plenty of Tombstone style flair into your home with DIY craftiness, this skull light is sure to plenty of eerie flair to any spooky setting! 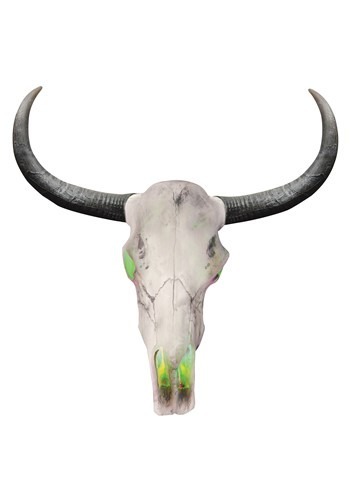 This skull stands out in anyone's decor with lights in the interior that can glow green and red. It runs on AAA batteries, some are included but you might want to have some on hand to keep your new favorite prop glowing. The skull's horns detach for storage and easily can be put together when you're ready to display it. Are you ready to whip up a little bit of the old west this Halloween? You'll find all sorts of props in our decor. From an animated Ouija board to raven props and poseable skeletons, you can really get creative. whether you're decorating inside your living room or out in the yard, we'll make sure this Halloween gets weird!